We are going to learn how to leverage the capability of adding attributes to nodes. This feature is fully described in the 属性 section of the 構造 chapter. In this cookbook we'll create a simple addition to the 電卓 tutorial language that will allow the input and output fields of the calculator definitions to have descriptive comments attached to them. These descriptive comments will be propagated into the generated Java code in the form of "pop-up tooltips" attached to the Swing text fields corresponding to the input and output fields. Since MPS 2018.2 documentation comments can be seamlessly inserted into code in any language without explicit support in the language itself. The feature is described in 一般的なプレースホルダーと一般的なコメント . Adding support for comments into languages is no longer necessary, unless you want to greatly customize the way comments are used. Nevertheless, this cookbook focuses on attributes and is still highly relevant. We chose the Calculator tutorial(英語) language as a testbed for our experiments. You can find the calculator-tutorial project included in the set of sample projects that comes with the MPS distribution. I recommend you skimmed through the tutorial to familiarize yourself with the language before we continue. Now both InputField and OutputField concepts have to implement the new ICanHaveDescription interface. You need to specify additional qualities of the new annotation by setting values for role as well as attributed concepts. We set the role for the annotation as descriptionComment. This is the name to use in queries in order to find out, whether a node has been annotated with DescriptionAnnotation or not. We also indicate that the annotation can only be attributed to nodes implementing ICanHaveDescription , which in our case is InputField and OutputField . The editor of DescriptionAnnotation is the key element in defining the visual behavior of nodes with description comments attached to them. We prepend the annotated node with a "described" constant and append the actual description text wrapped in parentheses. The attributed node cell represents the editor of the actual node - the node that the attribute is attached to. To toggle the description comment of a node on and off, we will create new KeyMap . 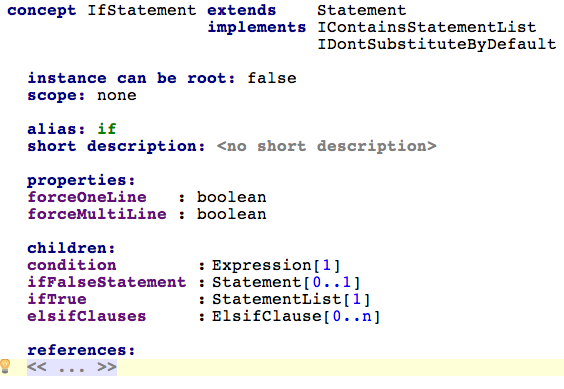 To edit the code we will use concepts from BaseLanguage and smodel, which should be available by default. If not, import them through Control/Cmd + L. We will also need the actions language in order to create initialized nodes easily. This one will most likely need to be imported explicitly ( コントロール+ L ). Whenever Control + Alt + Shift + D is pressed on a node implementing ICanHaveDescription , the action will add or remove the DescriptionAnnotation to/from the node. The KeyMap now needs to be added to all fields that should react to Control + Alt + Shift + D . This is to InputField and OutputField in our case. The editor cells that should react to the Control + Alt + Shift + D key combination must have the key map specified in the keycap property. The DescriptionAnnotation is currently lost during the generation process. Instead, we would like to generate the Swing "tooltips" for the text fields that represent the commented input and output fields. When generating code we currently simply take all input or output fields in the calculator and generate JTextFields for them. In the constructor we also generate initialization code for each generated JTextField - this is the place, where we can attach a Swing "tooltip" the the JTextFields that represent an input or output fields with description comments. The $IF$ node macro will ensure that a "tooltip" is only generated for nodes with the DescriptionComment annotation attached. You may now consider checking out the 要求追跡言語クックブック , which provides a commented tour round the Requirement tracking sample project showing another practical use of node attributes together with multiple projections and scoping. We can finish our tour here. Both input fields and output fields can be described with DescriptionAnnotation and the generated code contains a "tooltip" for each such description.